New knives create a lesser work time in the kitchen because slicing and preparation is made easier, but overtime they lose their sharpness. This is where investing on the best manual knife sharpener comes into action – keep your blades for longer use by regularly sharpening them while producing professional output in the comfort of your own home. Why Should I Use a Manual Knife Sharpener? 1. There’s lesser chance of your knife being damaged. Electric knife sharpeners get the job done quickly, but since everything is automated, sometimes the blade gets damaged or proper alignment is not achieved. If you have high-quality blades, a manual knife sharpener is better because you have total control of the process and there is less risk of any blade damage. 2. It adds to your kitchen skills. Kitchen skills are not only limited to cooking itself, knife sharpening can be added in your skill set. Getting used to manual knife sharpening methods make you always prepared for any situation. If you attend a party wherein an immediate sharpening is needed, then you’ll be the lifesaver. 3. It will extend your blade’s lifespan. Anyone who owns a knife should have a knife sharpener, for knives to last it should be regularly sharpened. Having a manual knife sharpener will make the job fast for you by not having to bring them to professional shops. Sharpening stones can either be hard oilstones or soft waterstones; hard stones need mineral oil or kerosene as lubricant and soft stones are aided just by using water. These traditional sharpening tools require constant practice as you solely rely on your hands and eyes for checking and sharpening the blade. Using stones requires a lot of time, and is not the greatest option for regular kitchen duties. These manufactured sharpeners use a V-shaped cutting notch that carves a new edge, regardless of the original blade’s original edge. They’re usually made from tungsten carbide that is hard enough to reset the blade’s form. A manual blade grinder basically uses a fixed rotating wheel that is either an abrasive ceramic or diamond-coated steel. This grinds the edge of knives to produce a sharper blade. What Should I Look For When Buying a Manual Knife Sharpener? 2. Has an ergonomic and convenient design. Look for a tool that has a grip design so you can easily position yourself when sharpening. Read which material was used for the sharpening material, this will likely dictate the kind of sharpening output you can expect.If you have high-quality blades, choose a product that can compliment your knife and will ensure a safe sharpening process. Set aside the price matters and invest on a knife sharpener that can last a long time. Look at the build quality, if it is made from plastic then see that it is not the brittle kind. Have a feel of the screws and the connections, take into consideration that it should be sturdy enough to handle even bigger knives. The Besiva 3-Stafe professional manual kitchen knife sharpener is a 3-stage sharpening system that gives the option of finishing, polishing, and exact grinding your blade’s edges. It comes in a solid ABS plastic body designed to withstand regular usage and is made with a handle to provide a comfortable grip to the user. Sturdy plastic body and well-built. The sharpening material loses its capacity to create a sharp knife after a few use. 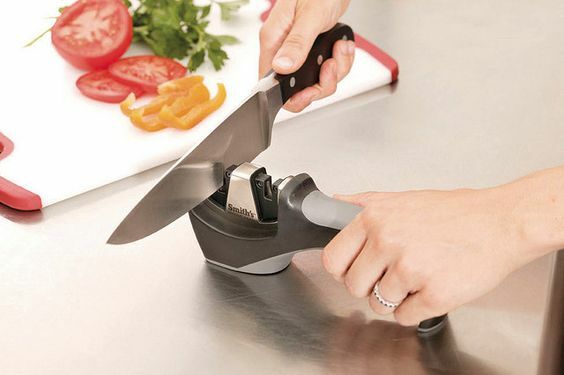 The KitchenIQ 50009 knife sharpener is a compact tool that only measures 4.3 x 5.9 inches and weighs around 0.6 ounces. The sharpening system comes in two slots: coarse is for the dull and even damaged knives, and the fine slot is for polishing the knife or for touch-ups on an already sharp knife. It has an Edge Grip feature, and is basically made compact for easy storage, but not compromising on work output. 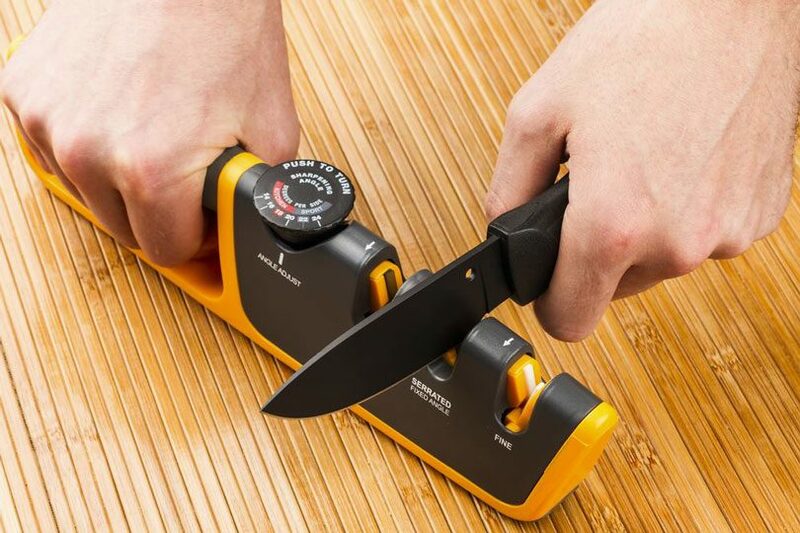 Can be used as a travel sharpener for outdoor trips. Ceramic stones for fine honing lose shape quickly. Chef’s Choice is a well-known producer of knife sharpeners, and this 4643 ProntoPro 3-Stage Manual Knife Sharpener is one of their quality products. It is created to accommodate any blade ranging from kitchen knives to sports and pocket knives. The end product of the 4643 ProntoPro is an arch-shaped edge that gives a stronger and durable blade. No instructions included in the packaging, improper use may damage your knife. Different from how other manual knife sharpeners look, the Victorinox Manual Knife Sharpener is a handheld device that is almost similar to the size of a knife’s handle. It is built with durable sharpening plates that are precisely angled resulting to a keen and razor-sharp edge. This device measures approximately 1-2/5 by 4-2/3 by 9 inches, compact and sturdy. Capable of sharpening even pocket knives. Does not come with the added feature of manual knife sharpeners that are not handheld, cannot provide grinding, solely used for sharpening blades. Brod & Taylor’s Professional Knife Sharpener looks a little bit intimidating as it differs from the usual form of knife sharpeners. This solid stainless steel sharpener weighs 2 pounds, and is made in Austria. It works for both serrated and non-serrated knives as the sharpeners are made from tungsten carbide that can last up to 5 years, and comes with replacements. The hand-polished solid stainless steel material gives an elegant touch to your kitchen. Check out the following sharpener! The products mentioned above are of great quality and features, but what stood out is the Victorinox Handheld Manual Knife Sharpener. It is not in the form we are accustomed to, but it delivers a great job in keeping knives in their top shape. The added feature of being able to turn the hard plates is a great addition that makes it a long-lasting product. It’s easy to clean, dishwasher safe, portable, easy to use, and the results makes it the best manual knife sharpener. This may be the product that can give you a greater kitchen preparation experience.